"...suspended particle in the liquid"? Metamaterials spoken here.... no idea what you mean by this. Definitely NOT as efficient as a Fourier aperture. You need to look at the sidelobes. Not pretty. i'm getting to tinker with the new Kymeta flat panel antennas. Those are some fascinating antennas. Those of us who have worked in the LF and ultrasound/ultrasonic industry are somewhat familiar with the electromagnetic radiation (radio waves) that are emitted by piezo elements. Congratulations to: Mark A. Kemp, Matt Franzi, Andy Haase, Erik Jongewaard, Matthew T. Whittaker, Michael Kirkpatrick, and Robert Sparr! A lithium niobate piezo rod is held in a fixture (with a metallic toroid at the top to shape the field). The fixture can be inside a vacuum or insulating gas container. The piezo rod is utilized as oscillator-transmitter-antenna by excitation with a function generator. The piezo rod mechanically/acoustically oscillates at around 35 kHz. It also radiates electromagnetic waves (radio waves) at around 35 kHz. This method of using a piezo as a miniature transmitting antenna at LF seems to be more efficient than a conventional miniature transmitting antenna of the same size. Voltage developed across the crystal is 125 kV. Average power dissipation is 120 mW. The piezo has a Q of about 300,000 or more. For 2FSK, the piezo element's oscillator self-resonance is pulled ~7 Hz by a relay/capacitor circuit in synchronization with the function generator. Slow baud rate Frequency Shift Keying is shown. KI4AX, G6FLW, AB2YC and 3 others like this. Antennas are about gain and power pattern. Lets say that the antenna you mention was , oh, 60% efficient. Then to get the same gain, the area would have to be increased by over 66% to get the same gain as the paraboloid. That means you would have to make it 30% bigger in diameter. That mean the cost would increase by roughly 50%. That means the power needed to electrically steer the antenna would increase by at least 25%. That means the itchy sidelobes would increase by roughly 30%. Phased subarrays are flat, take less power, and are more efficient. Don't confuse a matched filter with equivalent performance of an antenna. KI4AX and NU4R like this. Apples and oranges, Bonnie. What you really mean is that they found an efficient transduction method. 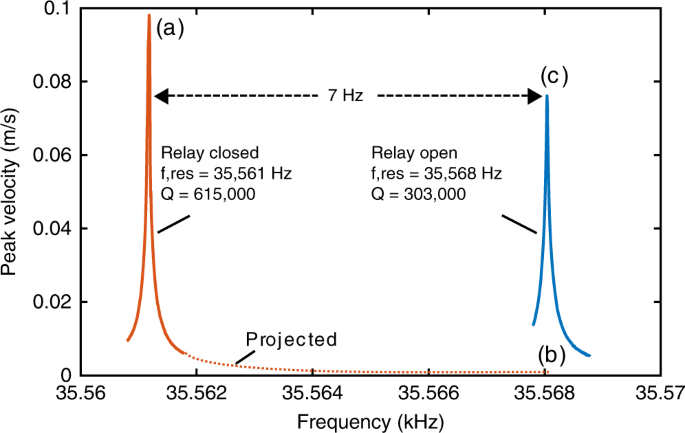 Superconducting antennas are more efficient. Albeit problematic at present. This might be useful for miners, trapped..
3) the power is indeed feeble. If you try to generate any reasonable power from it, then the system goes non-linear. re: "I’d like to talk to them about 160 meters. That is a band that is hard to talk on. " I'd say, you just haven't searched hard enough for a solution ... there are workable solutions out there, it's just, no one looks hard enough. The 'League' pubs don't help either. I’d like to talk to them about 160 meters. That is a band that is hard to talk on. ON4UN's "Low Band DXing". p.s. It's not just about DXing; Covers 160m - 40m. Well I strung up a end fed 9:1 bauln with 285 feet of wire as high as my trees, which are about 35 feet. I guess the Rx-Tx is ok - but id like to talk to anybody out of the 350 mile area.. I think it has to do with the curvature of the earth.. And lets not forget the sun has gone to sleep till 2020... But thanks for you input..